Two presidents discussed bilateral relations, cooperation in the field of tourism and Serbia's support in the global fight against terrorism. 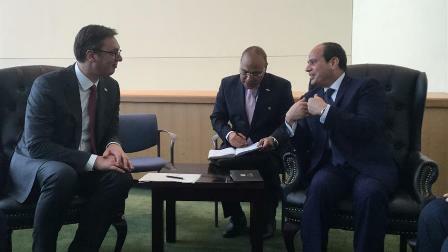 Vučić stressed that there is a decades-long friendship between Serbia and Egypt, that it is necessary to develop bilateral relations faster, and work on increasing trade. He also stressed that an atmosphere has been created for the re-launching of the two countries' cooperation committees. President El Sisi emphasized that he wants to work on improving the relations between the two countries, as well as on organizing a mutual visit, which will greatly contribute to improving the cooperation between Serbia and Egypt.